Yesterday was quite a meteorological treat, with interesting clouds and an amazingly colorful sunset. But it was also a good example of mid-level instability--when the mid-levels of the atmosphere starts to break out into cumulus-like convective features. Yesterday, a weak upper level disturbance was approaching, with upward motion aloft, producing an unstable layer above the surface. 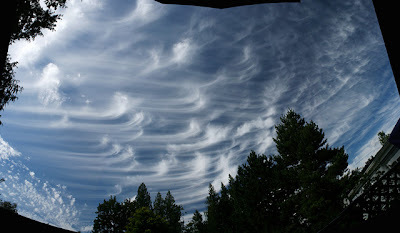 The curved ice crystal "tails" falling from the cirrus are often called "mare's tails." Why are they curved? The reason is that the wind speed change with height--usually decreasing below the main body of the cirrus--thus the curve. But as the day progressed the air at mid-levels started to convect into small cumulus, actually altocumulus. Some of these cumuli developed tower or turret shaped features--they are known as altocumulus castellanus. Now that is name that will impress your friends! Just say that casually at some party and it will turn some heads. An offshore band was particular impressive. And an added features---Mt. Rainier developed a nice "cap" during the afternoon...a sign of moisture and lift aloft. It is now clear that Hurricane Irene is going to savage the East Coast--a really serious storm. But for us, just the opposite. The warm, perfect weather will continue through Sunday, with perhaps a slight cooling on Saturday. And a reminder---I will be teaching Atmospheric Sciences 101 this fall if anyone is interested. UW students, of course, and others who want to take it as non-matriculated students. Retired folks can get in for practically nothing. When Did Irene Stop Being a Hurricane? The New Coastal Radar Delivers! Bogus Arguments of Some Global Warming "Skeptics"
The Upcoming Week AND What Have We Been Missing?